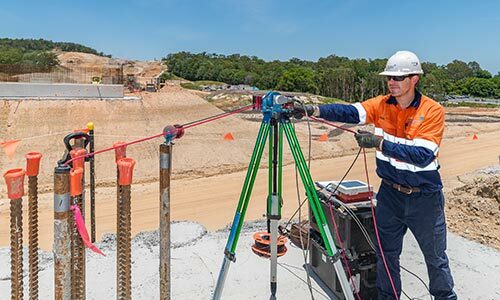 FSG provides a range of pile integrity assessment services to projects across Australia. The Pile Integrity Tester (PIT) gives peace of mind that a pile or shaft is free of “major” defects. The PIT test consists of attaching an accelerometer to the foundation and using a hand-held hammer to impact it. The PIT collects the acceleration data and displays curves that reveal any significant changes in cross section that may exist along the shaft. The PIT performs wave equation-based non-destructive test known as Low Strain Impact Integrity Tests or Low Strain Dynamic Tests. These test may be performed by the Pulse (or Sonic) Echo or Transient Response Methods. PIT is a relatively fast and low cost test, making it suitable for testing a large number of piles on a job site. Although the PIT setup and data collection is quite simple, the proper interpretation of its results requires a high level of multidisciplinary knowledge and expertise. FSG’s team of testing engineers are highly experience with the interpretation of PIT data and we are considered to be the industry leader in low strain integrity testing. The Cross-Hole Analyzer evaluates the quality of concrete in pile shafts and diaphragm walls by the Crosshole Sonic Logging (CSL) method. Drilled shafts and other cast-in-place concrete foundations are prepared for the test by installation of PVC or steel tubes during their construction. During the test, a transmitter is lowered down one of the tubes and sends a high-frequency signal to a receiver located in another tube. Transmitter and receiver move down each pair of tubes, scanning the entire length of the shaft. Field data is transferred to outputs graphs such as First Arrival Time, Wave Speed, Waterfall Diagram and Energy Plot which are used to evaluate the shaft integrity. While PIT has limitations on test depth due to signal attenuation, CSL does not have such limitations and generally provides a more detailed evaluation of concrete integrity between access tubes. A limitation of the CSL testing method is that concrete outside off the tubes cannot be assessed. 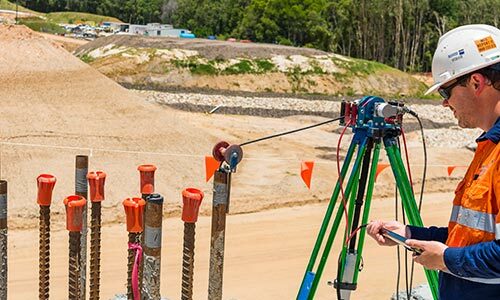 This relatively new test method is arguably the best approach for evaluating the integrity of large diameter bored piles. The Thermal Integrity Profiler (TIP) uses the heat generated by curing cement to assess the quality of cast-in-place piles. It can also be used for quality control and shape evaluation of jet grouting, slurry walls, and diaphragm walls. TIP works on a simple engineering basis: The average temperature within a concrete shaft is dependent on its diameter, the concrete mix design and on the time of measurement relative to concrete casting. Measured temperatures at the reinforcement cage vary with the distance to the centre of the shaft and with the concrete cover. In comparison with CSL, which can only assess the area within access tubes, TIP evaluates the entire cross-section over the full length of the shaft. While CSL and PIT need a minimum concrete age of 7 days prior to testing, TIP is performed immediately after concreting and results are available 24-48 hours after pouring of the shaft is complete. TIP identifies necks or inclusions (regions that are colder than average), bulges (regions that are warmer than average), the estimated effective shaft radius, variations in concrete cover, and the shape of the shaft and cage alignment. 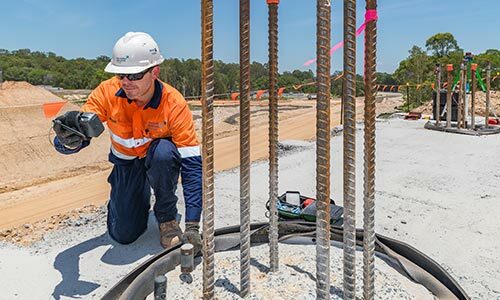 The TIP conforms to ASTM Standard D7949 – Standard Test Methods for Thermal Integrity Profiling of Concrete Deep Foundations. Visit www.pile.com/products for more information.